Have you ever experienced water beads before?! If you haven’t tried them out yet, you NEED to. If you have used them before, then you know how magical they are and how much children love them. They are incredibly easy to use and even easier to clean up since they practically clean up themselves! 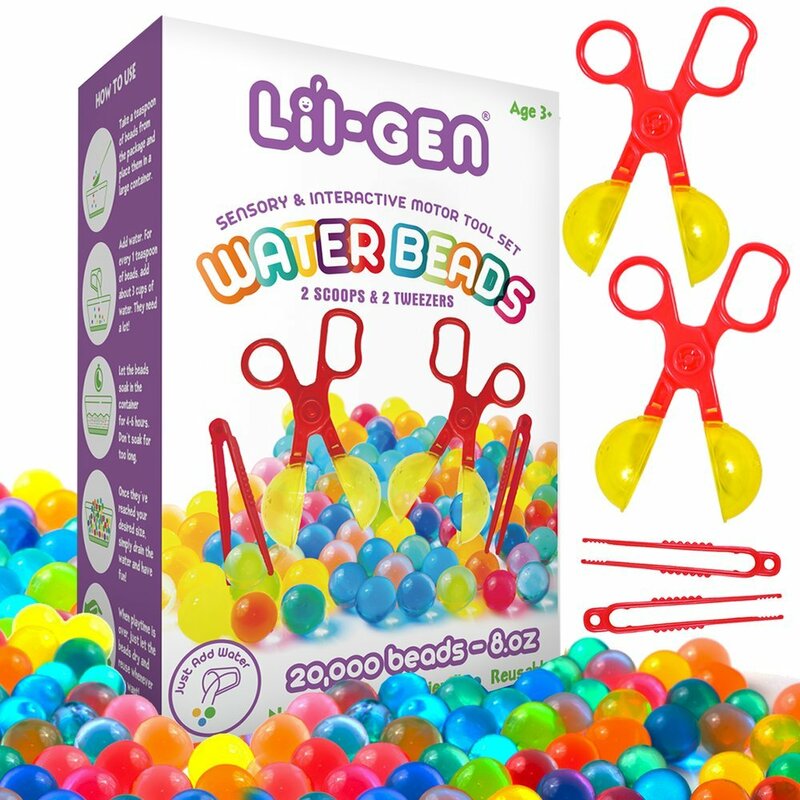 You simply soak the beads for 4-6 hours and they are ready to play! When playtime is over, you just let the beads dry and re-use them whenever you want! Water beads are not only fun, but also a great sensory tool for children of all ages. If you know me, or read my “About Me” section, you know that I was a teacher before becoming a Stay-at-home mom to my two adorable little boys. More specifically, I taught Transitional-Kindergarten the last two years before I decided to make the move to stay home. Sensory play was crucial in our classroom and is such an important part of the development process. I know that giving my children exposure to sensory activities is essential at their age. Let’s first talk about what sensory play is! Sensory play includes any activity that stimulates your young child’s senses. The five senses we focus on are touch, smell, taste, sight and hearing (we would also include movement and balance in the classroom). Sensory activities help kiddos explore and naturally encourage them to use the scientific processes while they explore and play. Sensory play doesn’t only have to be done in a classroom, you can do this at home too! Water beads are excellent for at home sensory play because not only are they ridiculously easy to use, but they are easy to clean up! You’re welcome Mama friends! I am going to give you 5 fun ways to use these cute little “color bubbles”, as my son calls them, in your own home! P.S. You don’t need to have a water table to do this. You can use a large plastic storage container or a small swimming pool! Anything goes! If you are playing with the water beads outside, this is a perfect activity for you! Water beads bounced everywhere on the concrete when my son was playing with them at his water table. I told him not to worry about it and we just let them bounce all over the place. When he was done playing with them at the table, I brought out his plastic toy hammer. I told him he could SMASH the water beads with his hammer. HE LOVED IT! I made it educational by having him find and smash specific colors. This was wonderful color recognition and hand-eye coordination practice! Don’t worry about the mess it will make… they dry up and you can just rinse or sweep them up off the concrete easily. These beads work BEAUTIFULLY in a sensory bottle with baby oil or just PLAIN WATER. 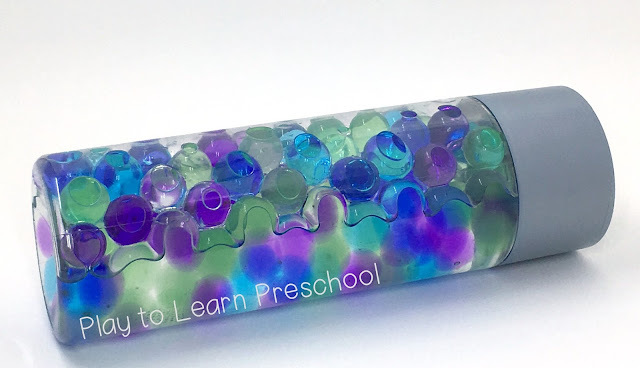 I got the idea of making this sensory bottle from Jamie White, blogger of “Play to Learn Preschool”. I actually let Jason help make our sensory bottle by picking the colors he wanted and allowing him to put them in the bottle. We just used a normal water bottle we had on hand, but the one pictured is a VOSS water bottle (much prettier). Helpful hint: Kids always want to open the bottle once it is done, so hot glue the lid on to “child-proof” it. When I gave Jason his completed bottle he said, “Thank you Mommy!” and immediately tried to open it! (Be one step ahead of the game and have it glued shut 🙂 ) This can be used as a great tool for comfort and relaxation! For a whole new sensory experience, freeze them! I took about 4 cups of the expanded water beads and simply stuck them in a freezer bag then popped them in the freezer. The next day when we went outside, I let Jason play with them however he wanted! Tip: Let them sit in the sun for about 30 minutes before you begin playing so it isn’t a rock hard blob. Once they defrosted a bit, Jason was able to use tools to chisel away at the frozen water beads to break them up and play. You could also freeze them in ice cube trays, jello molds, old Easter eggs, etc. The possibilities are endless! This one is the messiest of them all! I put shaving cream in muffin tins and allowed him to play with the water beads and shaving cream. He had A BLAST! He pretended to make little cupcakes (isn’t it great to see what they imagine on their own?!) I simply gave him muffin tins, some small bowls, a spoon and a whisk to play with. ALL I did was go through my kitchen and pull out items I didn’t mind him playing with. Easy, fun, and it didn’t cost me a fortune! This is excellent imaginary and representative play. To clean up the water beads, simply put them in a colander and rinse them off. Then let them dry out as usual. I am going to actually give you one more way to use these beads! All you need is a muffin tin, an egg carton or some small cups. We used the tweezers and scoopers that came with this set to sort the water beads by color. This is EXCELLENT fine motor practice that will help exercise those small muscles which control the hand. It was slightly challenging for him, but the practice was great. PLUS, we got color and sorting practice in there! A THREE FOR ONE ACTIVITY! Now the most important question… Where can I buy these? I bought our kit from a company called Li’l Gen. The kit I bought is low in price, excellent quality and came with two sets of tweezers and scoopers to use with the beads. You can’t beat the price with what you get! AND REMEMBER, you can RE-USE these beads! The beads in our water table all came from ONE PACK! If I were to do everything again, I would have probably only used half the pack for the water table and saved the rest for later. CLICK HERE to buy your own set! Water beads can be used in so many different ways! Kids LOVE THEM! You can get them in all different color assortments and do countless activities with them. Plus they are super easy to clean up! If you haven’t done a water bead activity at home, I highly encourage you to do one! You won’t regret it and your kids will have a blast! How else have you used water beads at your home or in your classroom? I would love to hear! I love that you are doing this blog!! It totally suits you!! Yet, selfishly, I will miss seeing your face at work!!! Go be insta-famous love!! I love water beads! I’m going to try the sensory bottle because my daughter is still putting everything in her mouth! But I can’t wait until she gets older to try more of your ideas! My kids loved them as toddlers and they are still playing with them today, years later. Not the same ones of course! But they are a great sensory toy! I don’t know how these keep slipping my mind!! I think it’s the only sensory activity we haven’t tried yet and I don’t know why because i know she will love it!! I can’t wait to get some and try some of these activities. I look forward to trying them and loved the sensory bottle idea!